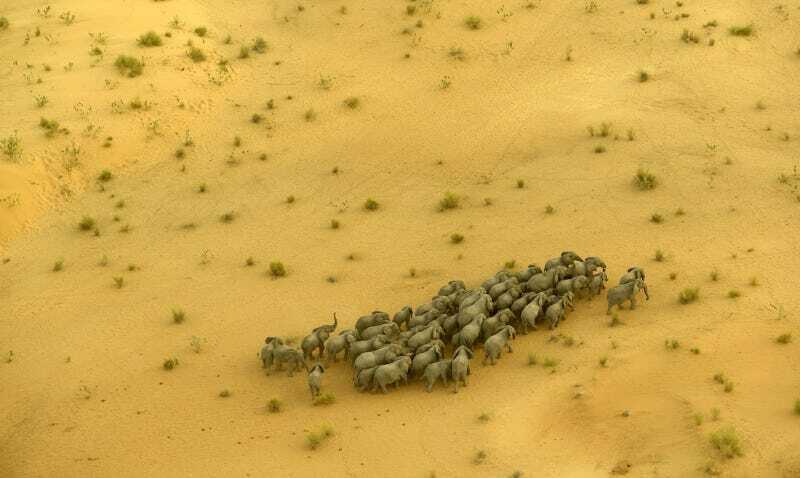 A herd of elephants in the desert near Lake Chad; there are less than 800 elephants remaining in the country. Kate Brooks for The Last Animals. When director and photojournalist Kate Brooks began filming The Last Animals, which premiered last month at the Tribeca Film Festival, there were seven Northern White Rhinos left on the planet. Now there are only three, all living under 24-hour armed protection at the Ol Pejeta Conservancy in Kenya. Sudan, the last male Northern White Rhinoceros, recently appeared on Tinder as the “most eligible bachelor in the world” in a campaign to raise money for reproductive technology research. After unsuccessful attempts at natural breeding, scientists are frantically trying to stave off the species’ extinction using in vitro fertilization. The Last Animals is an ambitious, agonizing documentary that weaves the plight of the dwindling Northern Whites into the illegal ivory and rhino horn trade and its connection to international trafficking organizations and armed groups like the Lord’s Resistance Army and the SPLA. The film, produced by a team of mostly women, covers the trial of Feisal Mohamed Ali, one of Interpol’s most wanted fugitives, who was eventually sentenced to 20 years on ivory smuggling charges. “The foot soldiers doing this work are cogs in a much bigger machine,” Brooks said. That machine, it’s noted in the documentary, wouldn’t run quite so smoothly without some government assistance. The scope of the film is wide—we’re spirited across southeast Asia, Africa, the Czech Republic, even a lab in Seattle—but it never veers far from the deeply emotional core of this subject. The camera gazes delightedly as a trio of squeaking baby rhinos toddle curiously over; catches the gleaming sweat running down a park ranger’s face; drinks in the quiet, radiating fury of tireless zoologist Sam Wasser as he stands surrounded by the tusks of a thousand dead elephants. At its world premiere screening, Brooks and the rangers featured in the film received the Disruptive Innovation Award for their work combating illegal wildlife trafficking. Healthy ecosystems are tough to find these days. Between 2007 and 2014, the African elephant population declined by 30%, and the African rhino population has declined over 97% since the ‘70s. In South Africa, home to 80 percent (about 20,000) of the world’s remaining rhinos, a court recently overturned a national ban on the domestic sale of rhino horns, a move activists warned would spur an increase in poaching levels. The last wild Northern White Rhino was seen in 2006 in Garamba National Park in the Democratic Republic of the Congo, where much of the film takes place, and the remaining elephants in the park are being annihilated in increasingly militarized and sophisticated attacks along with some of the park rangers fighting to protect them. Guards protecting the three remaining Northern White Rhinos at Ol Pejeta Conservancy in Kenya. Kate Brooks for The Last Animals. In Garamba, “it’s like a war zone—you have days and weeks and months where it’s totally calm, and then all hell breaks loose,” Brooks recalled. “So that’s the fear that rangers have every day.” One of the major characters in the film, the brisk, crinkly-eyed Colonel Jacques Sukamate Lusengo, was killed by poachers along with three rangers in 2015, shortly after the film crew left the park. “I was with the Maasai Mara, and this herd of elephants walked by while I was completely consumed with my thoughts of what I had just witnessed [in Afghanistan],” she recalled. “It made me sit up. It just reminded me that in spite of all the human destruction on the planet, there’s still a natural order. It really led me to want to help these animals.” She’d long felt “a gravitational pull” towards filmmaking; after exploring the basics in a video workshop, she had been invited to shoot as a contributing cinematographer on The Boxing Girls of Kabul with “virtually no experience.” That same year, in 2012, she was awarded the Knight Wallace Fellowship at the University of Michigan, where she began researching the connection between terrorism and the ivory trade. A ranger in Garamba National Park. Ryan Youngblood for The Last Animals. Brooks is well-acquainted with shooting desperation at close range, and The Last Animals is, above all, a story about desperation: of the researchers and activists trying to maneuver some of our most beloved and iconic large mammals away from extinction, of the heroic park rangers regularly hurling themselves into the line of fire, and of the poachers themselves, who are often poor locals. “It’s tragic. I mean, it’s all happening because somebody wants to buy a bracelet?” she marveled. It’s notable, too, the occasionally brutal level of intervention necessary to try and outpace the destruction reaped by our own species. One devastating scene shows scientists tagging a tranquilized, half-conscious Southern White Rhino they’d hoped to use to cross-breed with one of the remaining Northern Whites. Shortly after being dehorned (for protection from poachers) with a chainsaw, the shaking, terrified animal turns immobile and dies as five grunting men attempt CPR. Although Brooks remains hopeful that more can be done—“I don’t feel that this is a lost cause,” she emphasized during the interview—The Last Animals inevitably carries within it a tone of deeply felt grief. “You asked yourself whether time was spent wisely,” IZW senior scientist Dr. Robert Hermes says in the film, a note of despondence in his voice, amid failing efforts to breed new Northern Whites. Go to thelastanimals.com to learn what you can do if you live in one of the 44 states in the U.S. that haven’t passed strict legislation restricting ivory and rhino horn sales. To support a ranger, click here. Correction: A previous version of this post stated that The Last Animals was shot by a team of mostly women; it was produced by a team of mostly women. This post was also updated to clarify that Brooks was a contributing cinematographer on The Boxing Girls of Kabul.